We're looking for screencaps of gameplay on Dark Seas. It's possible that we end up using the winning entries on our store page. It's also possible we use several people's entries. So what we're looking for are several action packed bits of gameplay that you think highlight the best of Dark Seas and Puzzle Pirates. Prizes will scale depending on participation. However at minimum the winner will pick a standard Octo in any standard color. No all black, all white, hats, or limited edition colors. Other prizes will depend on participation, but will likely include things like a Greenbones doll, renamed ships, or other trinkets. The screenshots must highlight the gameplay or life on Dark Seas. Think of what you like the most or what you'd want people to see of the game. Image requirements: The image should be a .png. If there is a lot of blank space on your screen because of your resolution, you'll want to lower it. That means most gameplay should be at 800x600 (32 bit). However you can use higher resolutions if your highlighting areas that expand properly, like sea battles or island scenes. Please note that our TOS applies to links you post. Please avoid any inappropriate language in your image. Try to highlight the pirate world. So if there is chat, let's make it pirate speek. Upload your screenshots to an image hosting service. Provide a link to the larger image and then place the smaller inside your post so it's immediately viewable (using img tags). Include your octo color choice. No all black, all white, or limited edition colors. By entering you are consenting to allow us to use your screenshot for advertisement or other promotional material. This includes making edits or changes. Can the screen caps be editted? Also wondering if i may edit? i'm pretty good with photoshopping and making some nice screencaps with it. Please avoid any inappropriate language in your video. Probably copied from the other announcement thread, you may want to edit this to say "image". After seeing the first couple of screenshots, I'd like to make a suggestion for improvement. Prospective players like to see vital activity. They like to log on to crowds. They like to know that the game has life. Let's put our best foot forward and get lots of other pirates together for screenies, so that the diversity of the game is on full display. Imagine the faction/flag/crew pride if one of your screenshots wins and makes it into public marketing materials. Everyone appearing there has the opportunity to become famous. It's a win-win. Any news on the prizes yet? You've already noticed that your screenshots were used on our Steam store page (after a bit of editing). This should help give new players an idea of what the game has to offer. A note on judging. We decided that the winners would be based on which screenshots we ended up using and which entries were valid. A majority of your screenshots on the steam page consist of pictures that were coming from a seemingly invalid entry and I feel bad for that guy. It seems like you excluded that individual from the contest half a year after publishing his work - without screening the eligibility in the first place. Given that the screenshot entry he made was deemed invalid and thus not part of the competition, will the consequence be to remove them from the store page? Thanks Cronus for posting the results, I was beginning to wonder if the contest was forgotten. Congrats to those who were chosen! I'm sorry for the exceptionally long delay with results. (...) To that end, all winners will also receive a Cronus egg. Well I guess only the winners waited so long for the results and not the other participants? Unless it's a typo it would've been nice for all to receive the "apology" and not just those who won. Also interesting to note that entries with screenshots obviously taken on another ocean and not "highlight(ing) the gameplay or life on Dark Seas" were able to be valid and win and, if my eyes aren't mistaken, not used on the Steam page. 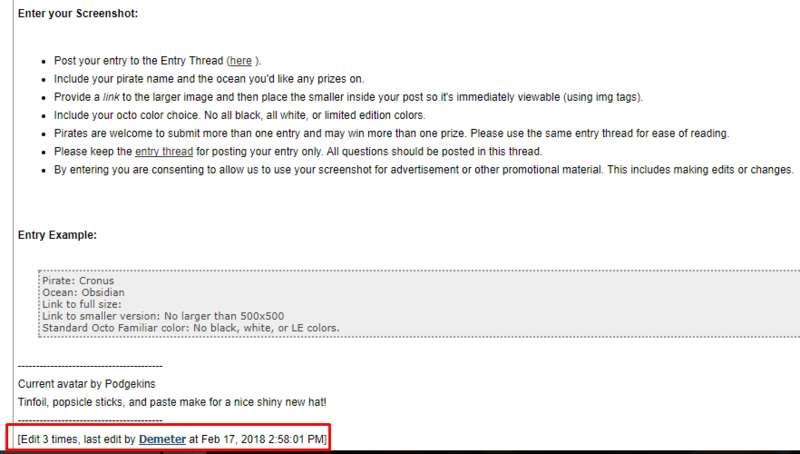 Oh well just me probably exaggerating a detail (however Hera's post in the Video Contest thread suggests the same) but would've been nice to have Obsidian Screenshots as winners since it was the theme. I guess the fact that, most, screenshots were alike was also a reason for the long wait and a hard job for Cronus to choose from. Furthermore, I also wondered on what the poster above me wrote. Will changes be made to the store page? Because I'm pretty sure that breaks the consent and agreement. We're not planning any changes. As per the event guidelines: "By entering you are consenting to allow us to use your screenshot for advertisement or other promotional material. This includes making edits or changes." If you are submitting your work and are deemed ineligible you do not enter the contest - its the same when an underage person applies for a contest. Also, how does an invalid submission make it into the contest or even the steam store page? You can't assume consent when one party invalidates their side of the agreement. And what is up with the edit on two 6 month old threads with "seemingly" no reasonable edits - right after the concerns about eligibility were raised by me and Masterdodo? Its almost like you were waiting with your response until that edit happened because I have the entering conditions different in my mind - and im pretty sure other people do too. It looks like the edits that were made were to change the titles of both threads from [Deadline 7/16, Judging Underway] to [Winners announced]. In the last post in the Video Clips Contest thread, after the winners were announced (but before the edits happened), Keaze comments that the title should be updated to reflect that the winners have been selected. Cronus clearly forgot to change the thread title and Demeter noticed it and fixed it. You are correct, I forgot to change the titles to help players know that the status had been updated. Thankfully, Keaze was kind enough to point it out so Deme could fix it.